We are proposing to introduce the following models into the Spa Croft Range in 2003. Please note that production of these models will depend on any not being produced by another manufacturer. If this is the case then an alternative will be sought. If we use your car as the basis for a Spa Croft Model, you will receive a model of your car as a token of our appreciation. All Lansdowne releases for 2003 are now available. 1949 Triumph 2000 Roadster . 1971 Vauxhall Cresta PA de luxe. Please Note that this issue is the Factory Special for 2003 and will only be available for a limited time. It is also a commemorative model celebrating 100 years of Vauxhall Motors. 1955 Dodge Coronet 4 Door Sedan. 1939 La Salle 2 Door Sedan. 1956 Plymouth Plaza Club Sedan. In addition to the above, there will now be a Brooklin Factory Special. Look out also for the new IPV (International Police Vehicles) range from Brooklin (See details below), another, but cheaper, Labatts brewers wagon (see below), plus new models in the Robeddie and US Model Mint ranges. IPV (International Police Vehicle) Range. 1953 Austin Somerset (Surrey Police) Now available. 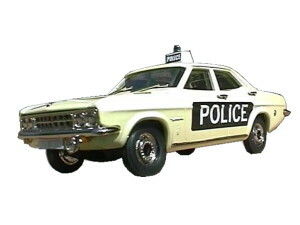 1949 Ford V8 Pilot (Cornwall Police) Now available. 1951 White Mustang Heavy Wrecker has been postponed. 1919 White Brewery Wagon "Labatt's"
Now Available. Click on image for more pictures. Keep visiting this page to see what else to expect in 2003 from the whitemetal manufacturers. When we know we will tell you.